Nationwide roadside & trailering assistance, 1-800-844-1409, USRider.org. What Friesian is the right one? When shopping for a Friesian--especially when unfamiliar with the breed--build up reference material by sample riding several of ours. For more info visit the Lesson & Visit pageor e-mail us. Ride a Friesian at our farm. from Sulphur Springs TX Animal Control. Free adoption. Donations so much appreciated. Want to exchange a link, advertise, put your banner in our arena or have us include your info in our visitor packages? Affordable, often even FREE. Some restrictions apply. Equine art, Apparel and Gifts of the Romantic Breeds by Dianne Diakowicz. customdesignart@aol.com. Fit, Style, Comfort, and Durability for The freedom to move. Superior Equine Grooming Products ... Since 1938! Anneke with her stallion Tropical Rider's Wieger. 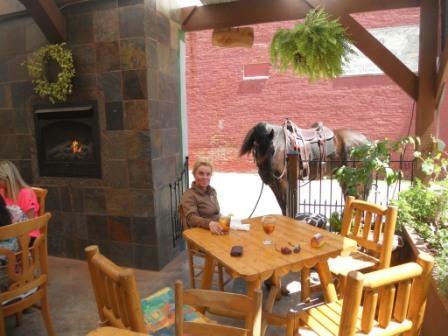 We take our Friesians to Liefie Li Vine restaurant in historic Winnsboro TX. South African cuisine, Texas wine, gifts. Our favorite place to eat with an apple for the horses! Sulphur Springs Chrysler Dodge Jeep. Favorite dealership where we bought and service our truck. El Sueno Espanol: top quality keuring and baroque tack. 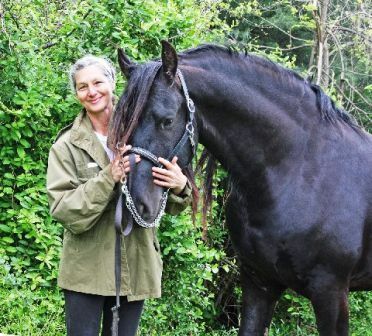 Special discount for members of Anneke's Friesians! Anneke is the provider of the simultaneous translation in English at the annual KFPS Stallion Show in Leeuwarden. Welcome to the Friesian gift & tack shop. Click on the contents topics listed below or scroll down the page. International orders welcome. Major Credit Cards accepted through PayPal. Order info at bottom of the page. 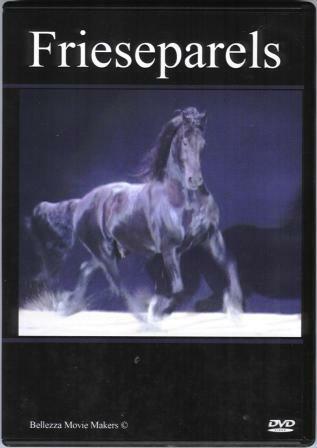 DVD Shop: learn all about the Friesian horse. 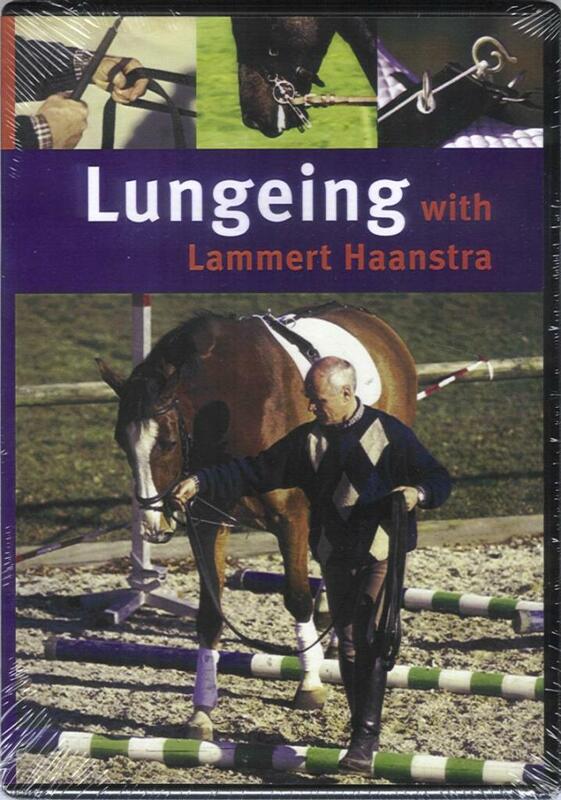 Lammert Haanstra Lungeing DVD: learn about keuring training. Raising & Training the Friesian DVD: learn about your Friesian & Friesian training. 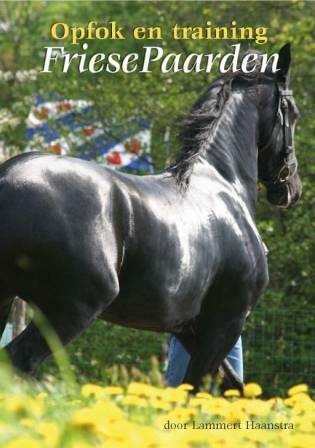 FrieseParels/FriesianPearls DVD: learn all about the breed; past, present & future. 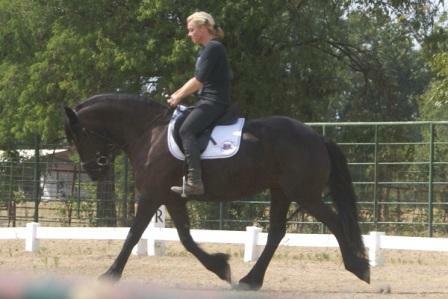 Top quality keuring, bling & baroque tack with special $discount$ for Members of Anneke's Friesians. Clickor scroll to view. Valentine, Pay-It-Forward, AF-KFPS Charity Auction. .
Pics f.l.t.r. 1. KFPS packet of 5 large luxury greeting cards, royal blue KFPS Royal Friesian halter & lead, KFPS bday calendar w/ 12 drawings. 2. Friesian Pearls multilingual Friesian dvd. 3. The Friesian statue mock-up (real life ca. 75') proposed for 2018, here with Anneke & friends at the 2014 HK. Anneke brought back several KFPS items from the Stallion Show, generously donated by KFPS for a purpose that fell through. We are adding a FriesianPearls dvd to this Pay-It-Forward Valentine Auction. E-mail Anneke by February 21 your pledge with (1) choice of item(s), (2) for at least the minimum price listed but hopefully you donate more, (3) and tell us the Charity of your choice to benefit. 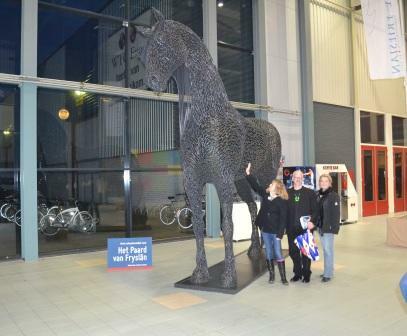 May we personally mention the option of 'Friends of the Friesian Horse Project' (see scale model at the Stallion Show for the proposed 75' statue in the photo above) for Leeuwarden Cultural Capital of Europe 2018. E-mail us if you need info on the project. On Feb 22, we will announce the winner(s) based on $ amount & charity. The winner(s) then send(s) that money DIRECT to their Charity. Upon confirmation of donation (DO NOT send US money!) we will ship to the winner(s) free of charge. Open to U.S. residents only, sorry. 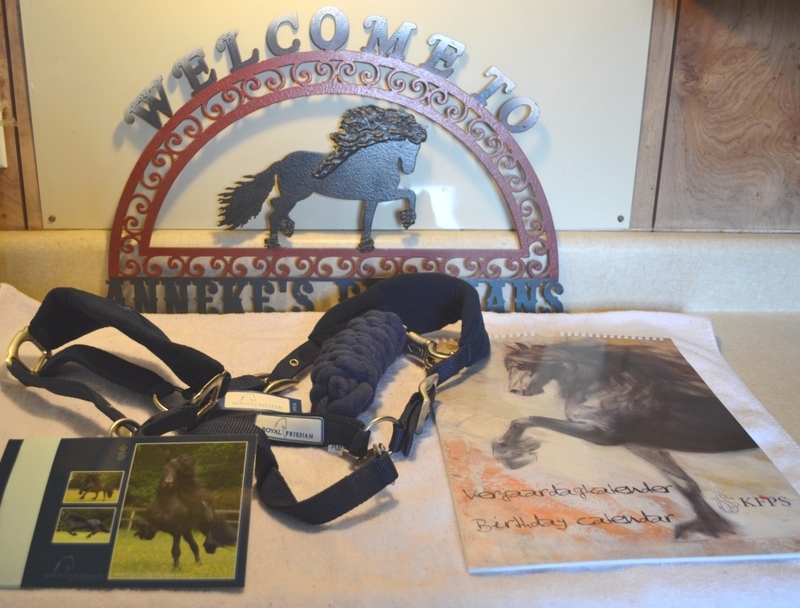 Starting charity bids: packet of five 8" x 6" glorious & glossy KFPS postcards $25; Royal Friesian KFPS halter in royal blue with logos & matching lead: $75, KFPS birthday calendar 12' x 17' with 12 fab drawings: $55; multilingual 77 min. dvd with amazing Friesian footage hosted by Omrop Fryslan Stallion Show co-host Henk Dijkstra: $65 (click here for dvd description). Free domestic shipping with AF membership (click). Raising & Training the Friesian Horse dvd. Learn all about the Friesian. 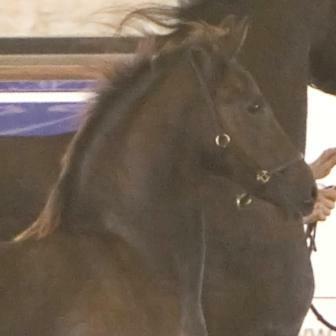 2-dvd set by stallion-show clinician Lammert Haanstra, with English voice-over, taking you from breeding to birth, through all raising & training stages, the keuring, and showing, following an actual Friesian stud colt. Translation for the voiceover by Anneke. $45 plus shipping. Now available. E-mail to order. 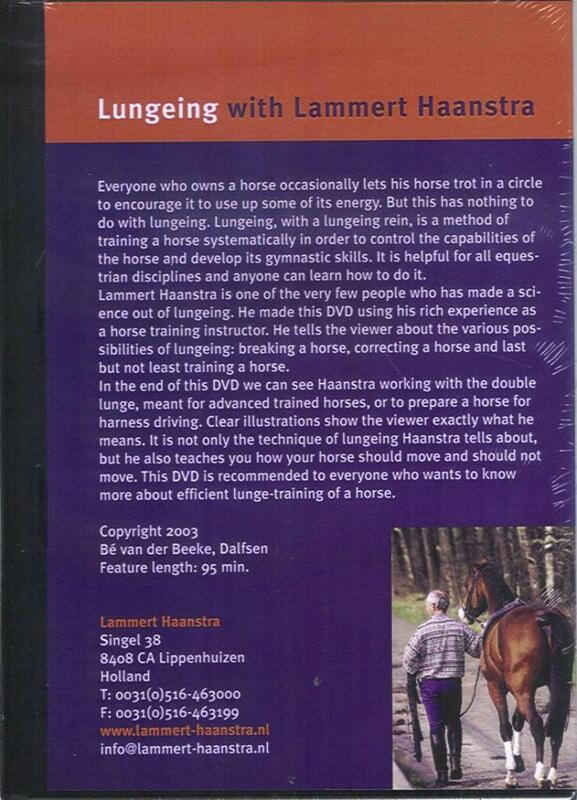 Lungeing with Lammert Haanstra (keuring prep) dvd. Learn all about getting your Friesian in shape for the keuring. By stallion-show clinician Lammert Haanstra with English voice-over. Accomplish any training goal on the lunge, great for keuring prep with thumbs up by KFPS Inspector Jan Hendriks! $45 plus shipping. Now available. E-mail to order. FrieseParels/Friesian Pearls dvd. Learn all about the breed. Fantastic movie of 77 minutes to learn all about the Friesian breed and watch in awe the amazing footage and educational information on the Friesian in all its splendor throughout the ages & present: dressage, side saddle, in harness, pulling the sjees, historic uses, trotting races, royal court, the stallions, tricks, at liberty, and more, filmed at historic Dutch locations. Choice of English, German, French or Spanish subtitles. $45 plus shipping. Now available. E-mail to order. Payment accepted by PayPal (e-mail for PP invoicing or send check or money order to: Anneke van den IJssel, P.O. Box 135, Como TX 75431. Scroll down to read more about the dvds or click on the red titles. Now available. The fantastic training DVD for you and your horse with English voice-over: Lungeing with Lammert Haanstra, Clinician at the KFPS Stallion Show, straight from the producers. Perfect for keuring prep with a step-by-step overview of various lungeing methods that will improve your horse and gets it show/keuring/sale ready. A thumbs up for this dvd by KFPS Inspector Jan Hendriks! Dutch magazine MENSPORT wrote: The result is simply breathtaking. Haanstra starts out at the beginning and clearly walks you through. Never have I seen it better explained what an over-the-back, flexible horse actually looks like. Getting your horse to be over the back and using its body in balance will become so clear you will never forget. But most beautiful are the slow-motion segments when you can see all the movements of the horse in detail. Only on the lunge line can a rider observe its horse in its totality. If you want to learn how to set your goals and reach them then this dvd is the best lesson material you could wish for. 95 minutes of material with English voice-over. Price: $45.- plus $5 regular shipping within the U.S., $15 shipping international. Credit cards accepted through PayPal. Now available. E-mail us to order. Important side note click here. Lammert Haanstra, Clinician at the KFPS Stallion Show. Learn all about getting your Friesian in shape for the keuring. Raising & Training the Friesian, taking you through all phases of owning a Friesian. Now available. 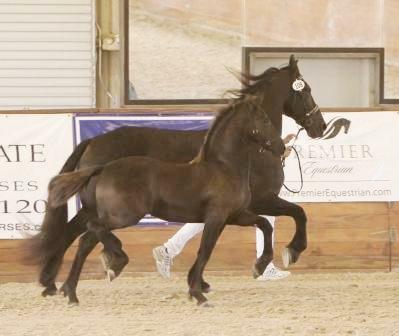 Straight from the producers: Raising & Training the Friesian by stallion-show clinician Lammert Haanstra. This 2-dvd set takes you through the life of the Friesian, with English voiceover, all filmed at famous Dutch locations, and following a real Friesian stud colt from conception through maturity. It is a beautiful movie that covers all topics from breeding to foaling, raising the foal, keuring time, training, showing, and more. This is the newest Haanstra dvd. Now available. 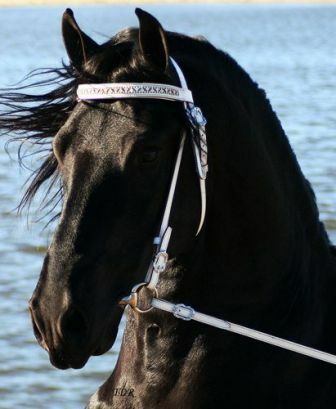 Straight from the producers: FrieseParels / Friesian Pearls, an amazing movie to learn all about the Friesian breed and watch in awe the fabulous beatuy of the Friesian horse. 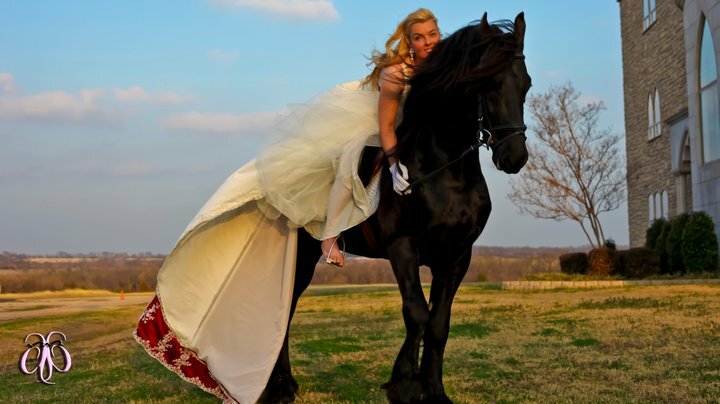 It premiered in April of 2007, is 77 minutes long, showing the versatility and beauty of the Friesian with gorgeous scenes, information on all about the breed, reenactments, and performances, set to beautiful music, which can even be played as a peaceful backdrop at any promo setting or at home. 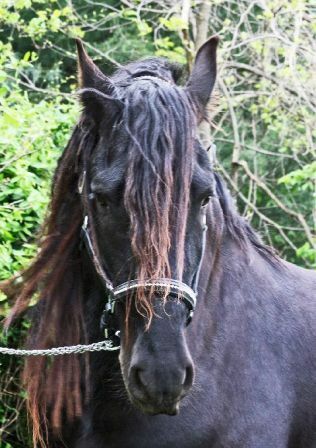 The history and present day of the Friesian is explained and proudly demonstrated: the breed's development and uses from high school dressage to modern-day dressage, in harness in tandems, four-in-hand, marathon, pulling the sjees, tricks, trotting races, approved breeding stallions, and much more. It has subtitles in English, French, Spanish, German, and Dutch if you click on that dvd-playing option. Price: $45.- plus $5 regular shipping within the U.S., $15 shipping international. Credit cards accepted through PayPal. E-mail us to order. Important side note click here. FrieseParels: the spectacular Friesian movie to learn all about the Friesian breed! International dvds (like the two Haanstra's and FrieseParels as well as other Friesian dvds you may pick up from, e.g., KFPS) play on computers, laptops, and portable dvd players beautifully (which many people do anyway and great at your booth at events! ), however, t.v.-connected players are regularly finicky and do not always play such dvds unless they are certified international players so unfortunately there is no guarantee this will play on your t.v. A friend has had much success with this site: http://www.regioncodefreedvd.com/ or check with your local dvd-equipment store for more info on t.v. connected dvd players with international capability. This is just how they are manufactured and this side note serves as a heads-up. Keuring Tack. We offer top quality, leather keuring tack with unique Anneke's Friesians' discounts (click here for discount info) direct from the producers. From bridles to halters, halters for youngsters, bridles for two years and up (as of two years the horses have to wear a bit), traditional white or black (both is used for Friesians), with or without bling (traditional is no bling but the bridle will not affect the score and it's subdued bling), for keuring and halter classes, with matching leather leads with stud chain. Click here for the selection. Baroque Tack. We also offer top quality baroque tack: bridles, saddles, and full presentation. Click here for the selection. Bling Halters also available. Click here for the selection. Discounts. Members of Anneke's Friesians enjoy special discounts as listed below in the inventory descriptions when they shop at this tack shop & present us with their coupon & order. Better yet, these discounts are valid not just for your full membership year so on every order, but also on all items per order (e.g. 2 bridles in one order, 2 x $25 off!). For information on membership and its benefits click on this link for the details. E-mail us if you have questions or would like to place an order. 1K. Traditional Keuring Bridle without noseband (also in black) & leadline. Made from soft and supple, thick, high quality cowhide leather. Has a rolled leather browband. Also available in black! Your choice of the stainless steel baroque cortezia buckles or plain, stainless steel square buckles on both bridle and leadline. 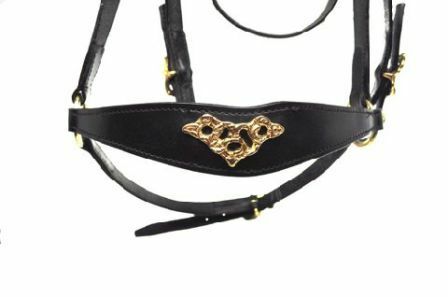 Includes matching 8 foot leather leadline with 24" stud chain; your choice of plain stainless steel hardware (see detail) or a baroque, cortezia buckle (see detail) depending on your bridle choice. Price $149.00 for the bridle & lead set. 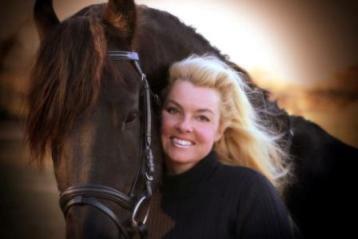 $25.00 discount with presentation of Anneke's Friesians' membership coupon. 2K. Keuring & Show Bridle with Bling Browband & separate noseband & leadline. 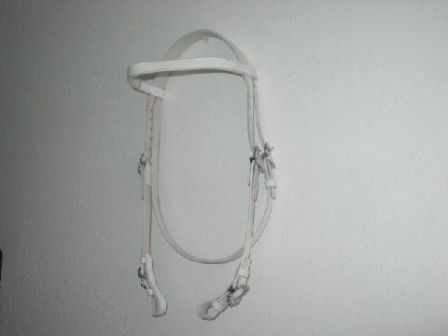 This is a show bridle that converts into a keuring bridle. It is well padded and made of soft and supple, thick, high quality cowhide leather. Beautiful, baroque cortezia buckles. 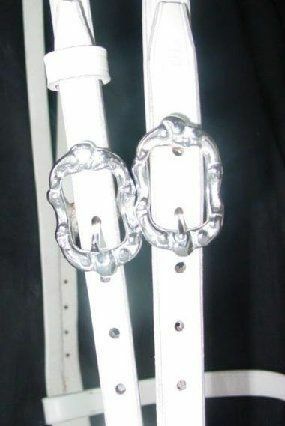 Includes a Swarovski diamond bling browband, which is padded . Included: matching leather reins and a matching 8 foot leather leadline with 24" stud chain with baroque cortezia closure buckle as well as a noseband (noseband not shown in pictures). Price: $199.00 for the complete set. 3K. 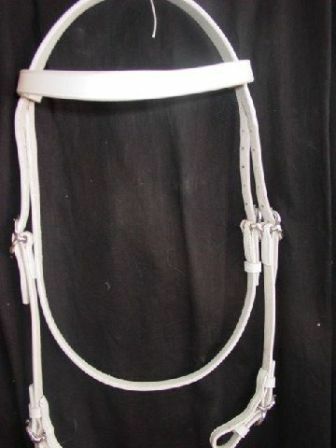 Keuring Halter in white or black leather. Use it to present your weanling or yearling in the ring or on your adult horse outside the ring. 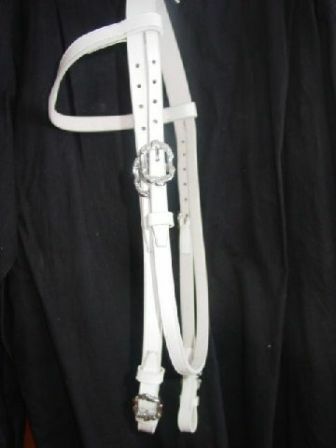 An elegant leather, padded halter made out of soft and supple, thick cowhide leather, 3/4 inch wide leather with fancy, small cortezia, baroque buckle closures (chin clip on the side, adjustable at the top and in noseband). Available in white or black leather. The white is available with silver (stainless steel) hardware. The black is available with gold (brass with goldplate) or silver (stainless steel) hardware. Please specify. Sizes: Weanling, Yearling, Full and Warmblood. 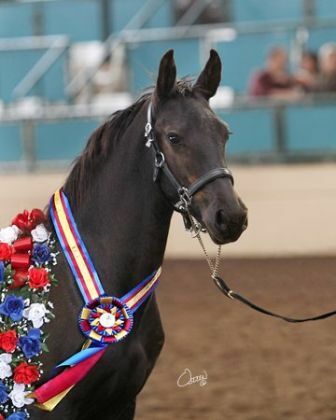 Price: $89 for he thicker bling variety (see photo with ribbon) or the traditional Dutch variety (see foal picture) for $60.00. 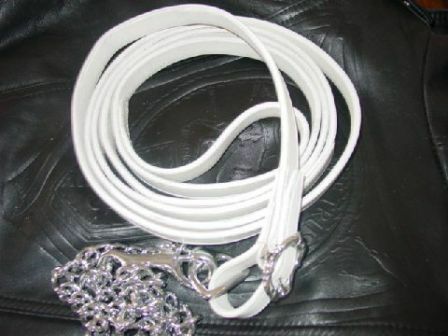 Available separately: matching 8 foot black or white leather leadline with 24" stud chain see below. 4K. Leather leadlines w/ stud chain, black or white leather, silver or gold hardware. 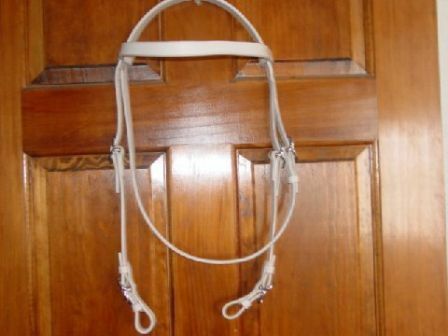 Perhaps you only need a leather leadline or you need it for the keuring halter above. These soft and supple, thick, high-quality cowhide leadlines are 8 ft. long with a 24" stud chain, can be ordered in white or black leather, and come with a choice of a plain hardware or baroque cortezia buckle; stainless steel (see detail). If you need gold hardware(brass with goldplate) please specify. 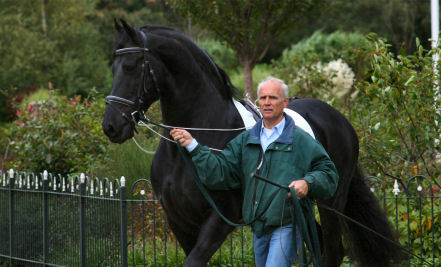 $5.00 discount with presentation of Anneke's Friesians' membership coupon. 1B. Portuguese & Dressage Bridle with reins. 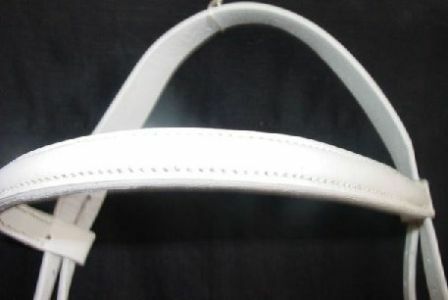 A Portuguese bridle with baroque cortezia buckles made from soft and supple, thick, high-quality cow hide leather, which also works great as a dressage bridle. See also breast-plate option below. Your choice of gold (brass with gold plate) or silver (stainless steel) hardware. Price: $150.00. Price for the more ornate/baroque version with either hardware is $180.00. Matches both the Portuguese (see above) and the German Portuguese bridles (see below) and is therefore available with gold (brass with gold plate) or silver (stainless steel) hardware. Fits full-size and warmblood-size horses. Made out of the same soft and supple, thick, high-quality cowhide leather. Price 150.00. Price for the more ornate/baroque version with either hardware is $170.00. Also available: full presentation breast collars (big medallions style). 3B. German/Portuguese Bridle with reins. Made from beautiful, soft and supple, thick cowhide leather. Has a separate noseband caveson, great for snaffle bits, very elegant look. Comes with gold (brass with gold plate) hardware. See also breast-plate option above. Coming soon: bits, baroque Spanish & Portuguese saddles & stirrups starting at $1500 to $1650, exclusive distributors of Ludomar of Spain. Also available full presentation, customized tack. E-mail us for information in the meantime. 4B. Leather leadlines w/ stud chain, black or white leather, silver or gold hardware. 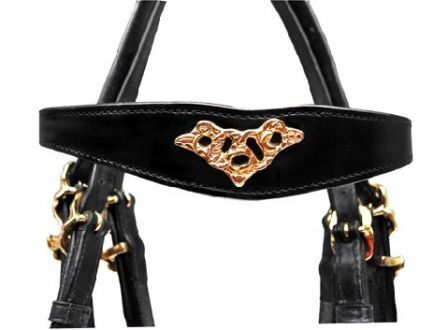 Perhaps you need a matching leather leadline with your baroque bridle. 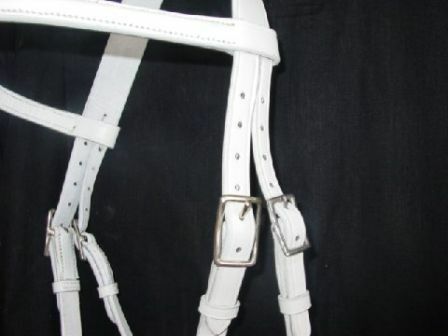 These soft and supple, thick, high-quality cowhide leather leadlines are 8 ft. long with a 24" stud chain, can be ordered in white or black leather, and come with a choice of a plain hardware or baroque cortezia buckle; stainless steel (see detail). If you need gold hardware(brass with goldplate) please specify. 1H. Fancy Black Diamond Halter. 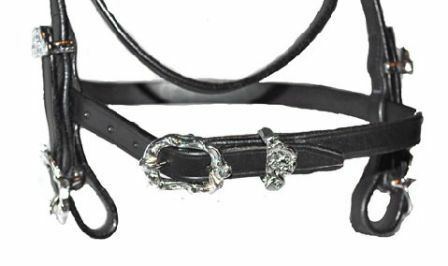 Made from black, 3/4" wide, soft and supple, thick, high quality cowhide leather, padded on the poll strap and noseband, with brilliant Swarovski crystals on the top of the poll strap and around the noseband. Stainless steel cortezia, baroque hardware and posh Padding on poll strap and noseband. A very elegant halter. Sizes: Yearling, Full and Warmblood. 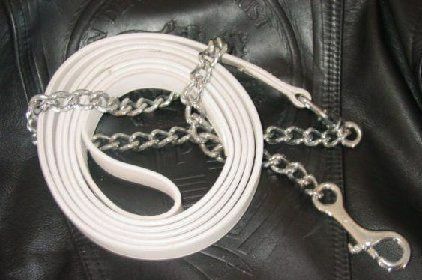 Available separately: matching 8 foot black leather leadline with 24" stud chain, see below. 2H. 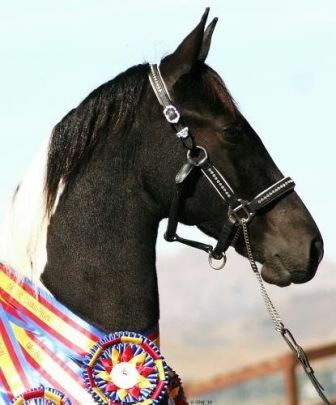 Fancy Black Halter with White Padding. 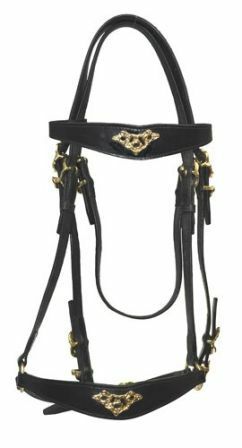 Made from black, 3/4" wide, soft and supple, thick, high quality cowhide leather, white padding on the cheek and poll straps and noseband, with brilliant Swarovski crystals on the poll and cheek straps and around the noseband. Stainless steel cortezia, baroque hardware and posh Padding on poll strap and noseband. A very elegant halter. 3H. Leather leadlines w/ stud chain, black or white leather, silver or gold hardware. 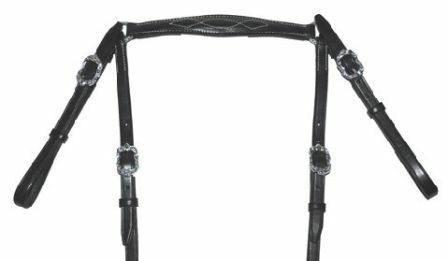 Perhaps you only need a leather leadline or want a matching leadline for the bling bridles above. 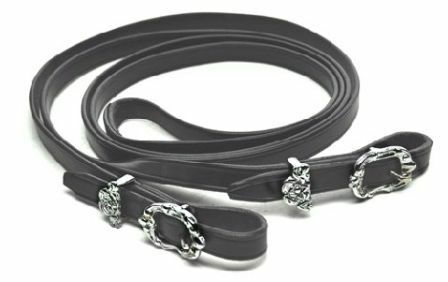 These soft and supple, thick, high quality cowhide leadlines are 8 ft. long with a 24" stud chain, can be ordered in white or black leather, and come with a choice of a plain hardware or baroque cortezia buckle; stainless steel (see detail). If you need gold hardware(brass with goldplate) please specify. 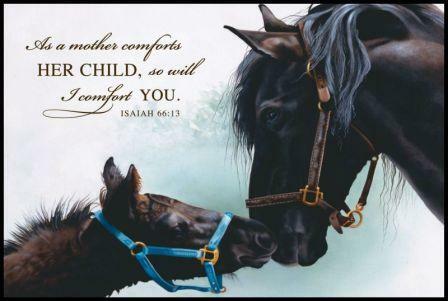 Send us an e-mail at frisian@earthlink.net or AnnekesFriesians@yahoo.com with your order and/or questions, we confirm the items & total due, then pay by credit card or e-check through PayPal or check/money order by mail. International orders welcome! Your order will be shipped promptly once payment has been processed. Sorry no returns or refunds. All sales are final. Mailing address: Anneke van den IJssel/Anneke's Friesians, P.O. Box 135, Como TX 75431. Questions about the items or totals? E-mail us at frisian@earthlink.net or or AnnekesFriesians@yahoo.com or call (903) 573-2021. (Photo header: Anneke & her stallion Tropical Rider's Wieger glamming it up, 2011. This site is a creation of webmistress Anneke van den IJssel and was last updated 04/02/14. For feedback on this website please e-mail frisian@earthlink.net. Copyright © 2005-2014 Anneke's Friesians. All rights reserved. Information subject to change without notice. Usage/copying without express written request and permission is prohibited. visitors since June 1, 2005.